Welcome to our virtual hotel. 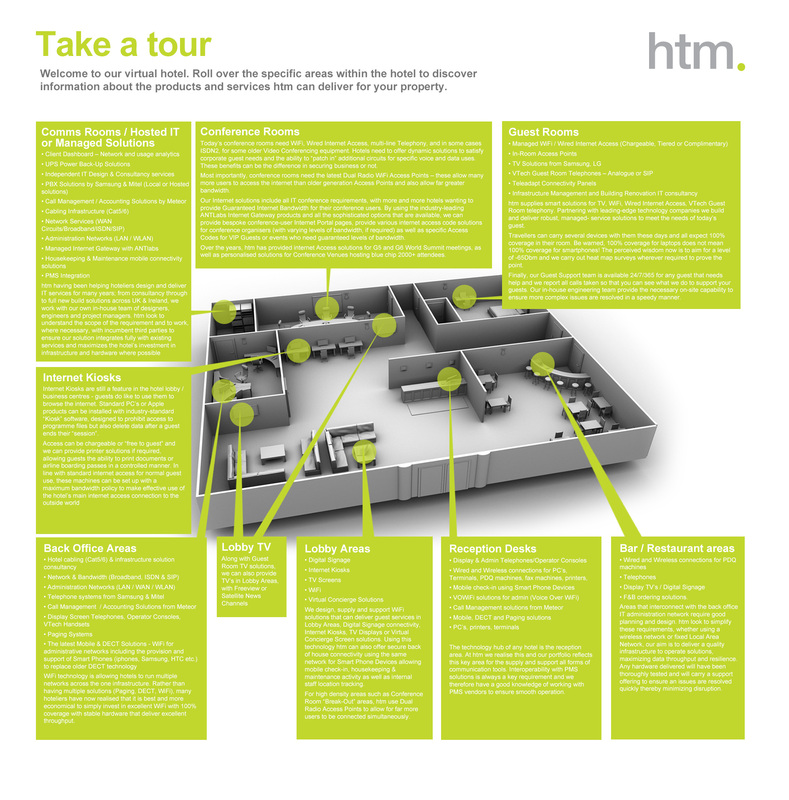 Roll over the specific areas within the hotel to discover information about the products and services htm can deliver for your property. htm having been helping hoteliers design and deliver IT services for many years; from consultancy through to full new build solutions across UK & Ireland, we work with our own in-house team of designers, engineers and project managers. htm look to understand the scope of the requirement and to work, where necessary, with incumbent third parties to ensure our solution integrates fully with existing services and maximizes the hotel’s investment in infrastructure and hardware where possible. Today’s conference rooms need WiFi, Wired Internet Access, multi-line Telephony, and in some cases ISDN2, for some older Video Conferencing equipment. Hotels need to offer dynamic solutions to satisfy corporate guest needs and the ability to “patch in” additional circuits for specific voice and data uses. These benefits can be the difference in securing business or not. Most importantly, conference rooms need the latest Dual Radio WiFi Access Points – these allow many more users to access the internet than older generation Access Points and also allow far greater bandwidth. Our Internet solutions include all IT conference requirements, with more and more hotels wanting to provide Guaranteed Internet Bandwidth for their conference users. By using the industry-leading ANTLabs Internet Gateway products and all the sophisticated options that are available, we can provide bespoke conference-user Internet Portal pages, provide various internet access code solutions for conference organisers (with varying levels of bandwidth, if required) as well as specific Access Codes for VIP Guests or events who need guaranteed levels of bandwidth. Over the years, htm has provided internet Access solutions for G5 and G6 World Summit meetings, as well as personalised solutions for Conference Venues hosting blue chip 2000+ attendees. htm supplies smart solutions for TV, WiFi, Wired Internet Access, VTech Guest Room telephony. Partnering with leading-edge technology companies we build and deliver robust, managed- service solutions to meet the needs of today’s guest. Travellers can carry several devices with them these days and all expect 100% coverage in their room. Be warned, 100% coverage for laptops does not mean 100% coverage for smartphones! The perceived wisdom now is to aim for a level of -65Dbm and we carry out heat map surveys wherever required to prove the point. Finally, our Guest Support team is available 24/7/365 for any guest that needs help and we report all calls taken so that you can see what we do to support your guests. Our in-house engineering team provide the necessary on-site capability to ensure more complex issues are resolved in a speedy manner. Internet Kiosks are still a feature in the hotel lobby / business centres - guests do like to use them to browse the internet. Standard PC’s or Apple products can be installed with industry-standard “Kiosk” software, designed to prohibit access to programme files but also delete data after a guest ends their “session”. Access can be chargeable or “free to guest” and we can provide printer solutions if required, allowing guests the ability to print documents or airline boarding passes in a controlled manner. In line with standard internet access for normal guest use, these machines can be set up with a maximum bandwidth policy to make effective use of the hotel’s main internet access connection to the outside world. WiFi technology is allowing hotels to run multiple networks across the one infrastructure. Rather than having multiple solutions (Paging, DECT, WiFi), many hoteliers have now realised that it is best and more economical to simply invest in excellent WiFi with 100% coverage with stable hardware that deliver excellent throughput. We design, supply and support WiFi solutions that can deliver guest services in Lobby Areas, Digital Signage connectivity, Internet Kiosks, TV Displays or Virtual Concierge Screen solutions. Using this technology htm can also offer secure back of house connectivity using the same network for Smart Phone Devices allowing mobile check-in, housekeeping & maintenance activity as well as internal staff location tracking. For high density areas such as Conference Room “Break-Out” areas, htm use Dual Radio Access Points to allow for far more users to be connected simultaneously. The technology hub of any hotel is the reception area. At htm we realise this and our portfolio reflects this key area for the supply and support all forms of communication tools. Interoperability with PMS solutions is always a key requirement and we therefore have a good knowledge of working with PMS vendors to ensure smooth operation. Areas that interconnect with the back office IT administration network require good planning and design. htm look to simplify these requirements, whether using a wireless network or fixed Local Area Network, our aim is to deliver a quality infrastructure to operate solutions, maximizing data throughput and resilience. Any hardware delivered will have been thoroughly tested and will carry a support offering to ensure an issues are resolved quickly thereby minimizing disruption.